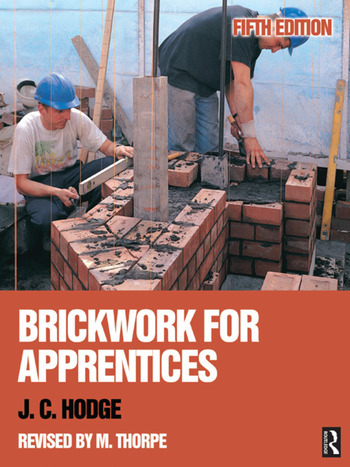 Brickwork for Apprentices has been the established reference on brickwork for generations of bricklayers. Continuously in print since 1944, John Hodge’s classic text has now been fully revised in its fifth edition by Malcolm Thorpe – who acted as a CITB Advisor and was involved in the draughting of the Intermediate Construction Award syllabus (bricklaying route) – to cover the brickwork craft-related units of the latest Construction Awards and related Trowel Occupations NVQs from CITB / City & Guilds at Levels 2 and 3. The fifth edition incorporates extended coverage on the relatively new area of thin joint systems, to match the latest industry-based requirements and technical developments in the field. Content has been brought fully in line with recent changes to the Building Regulations, ensuring that this text will remain an essential reference for qualified bricklayers and other professionals working in the construction industry, as well as NVQ students new to the industry and wishing to embark on a career in bricklaying. A new feature in this edition is the inclusion of multiple choice questions at the back of the book, matched to the current NVQ requirements, to provide students of the CITB / City & Guilds Trowel Occupations NVQs with essential practice and revision for exam preparation. Cavity walling and brick cladding. Chimneys, flues and fireplace construction.